Before continuing south along the inside passage , we make a stop in Petersburg to repair our anchor windlass. 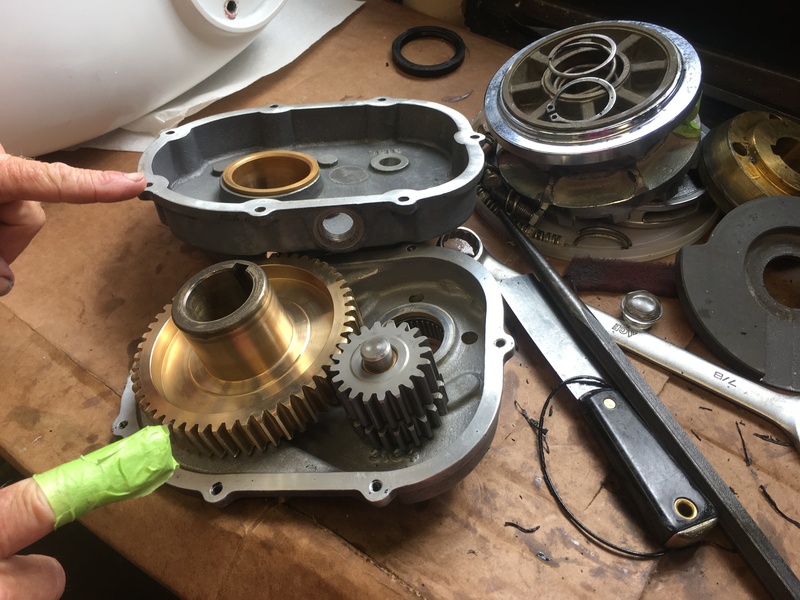 Jeff enjoyed working with Aaron the mechanic at Piston and Rudder to replace the seals on our anchor windlass and also did some prevent maintenance cleaning our main engine heat exchanger. An oil change on the engine and generator is also done while here. 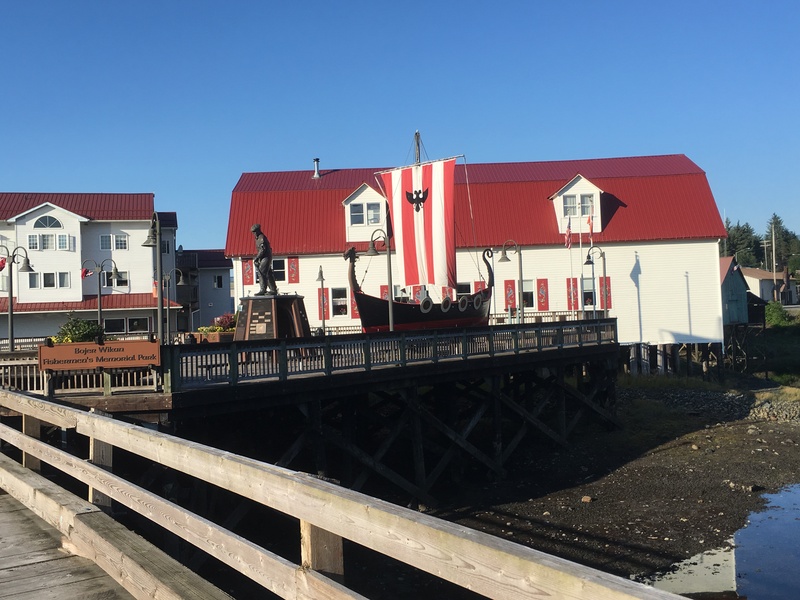 Petersburg is one of our favorite stops and we enjoy our four day stay. 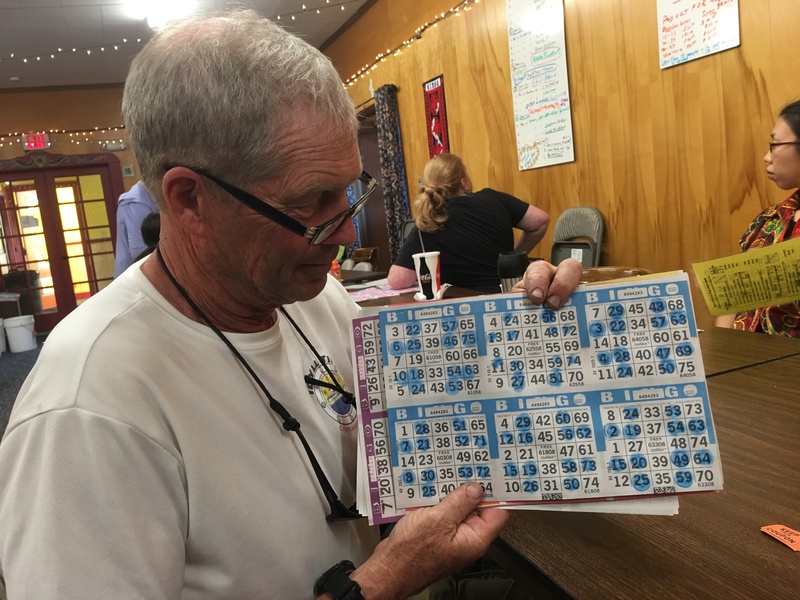 Friday night bingo at the Sons of Norway House was a highlight. We didn’t realize how complicated bingo could be. These folks take their bing seriously. Several locals tutored us and we were able to win one game and at least break even for the night. It was a late night for us starting at 7 PM and not ending until 11:30 PM. The next morning we have an easy transit of Wrangle Narrows. Entering Clarence Strait, we work our way along Prince of Whales Island to an anchorage called Exchange Cove. We spend two nights in this well protected anchorage. With the sight of salmon jumping out of the water we head out in the dinghy for some fishing. We soon land a really nice 14 lb. Coho. It is good to see the salmon are finally here. Up until now, fishing for salmon both I commercially and for sport has been very slow. We have heard it has been the worst year on record. Overfishing, habitat destruction, and climate change patterns all seem to have taken a toll on the salmon fishing. 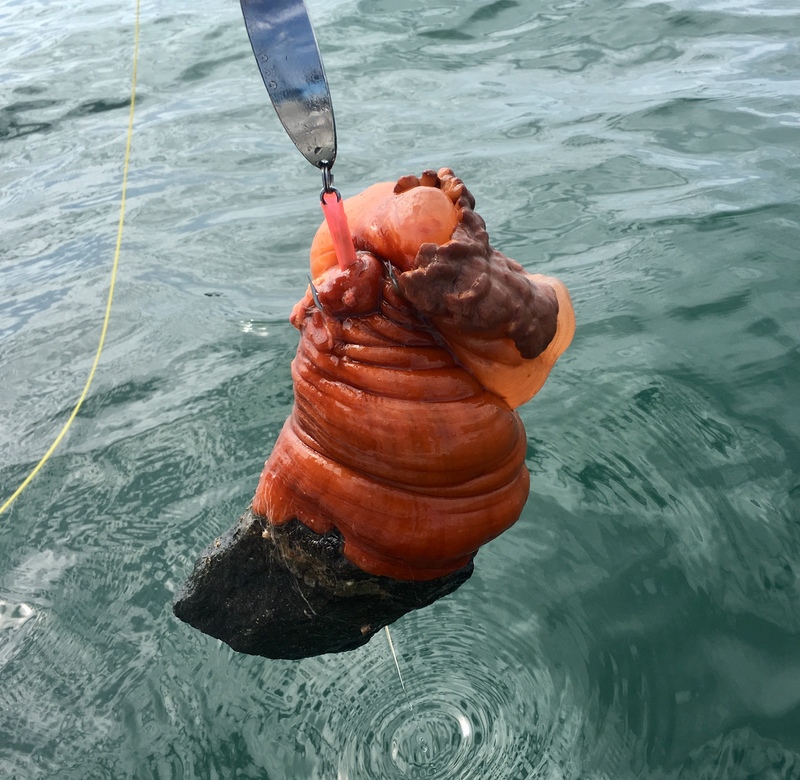 We continue working our way along the east side of Prince of Whales Island through the Kasheverof Passage which is a twisting channel around many rocky islets to the small town of Thorne Bay. Just outside the harbor entrance, the salmon are again leaping out of the water, a good sign for fishing. Ron the harbor master is on the dock to catch our lines. Prince of Whales Island, 140 miles long and 45 miles wide, is the third largest Island in the United States. It looks like we will be here for several days waiting on the winds in Clarence Strait to calm down so we decide to rent a car and explore the island. 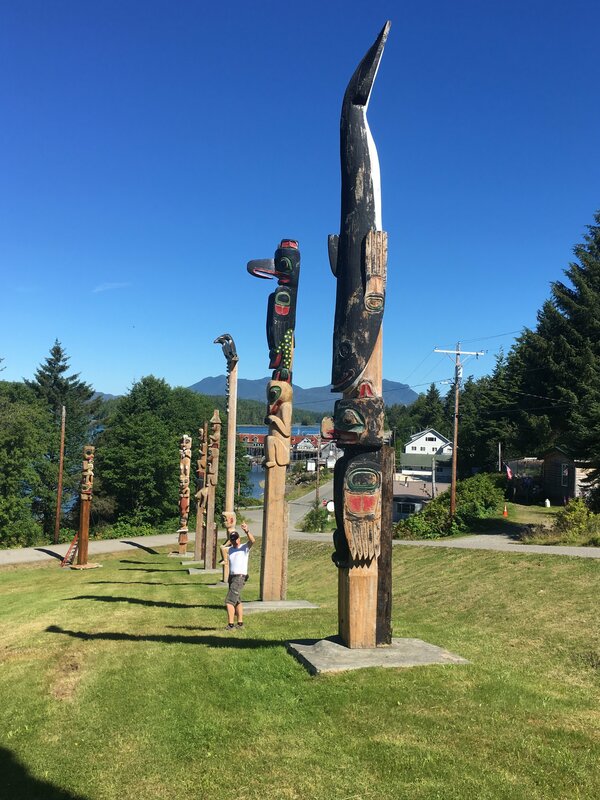 Our first stops are to the small fishing villages of Craig and Klawock where we visit several totem parks. 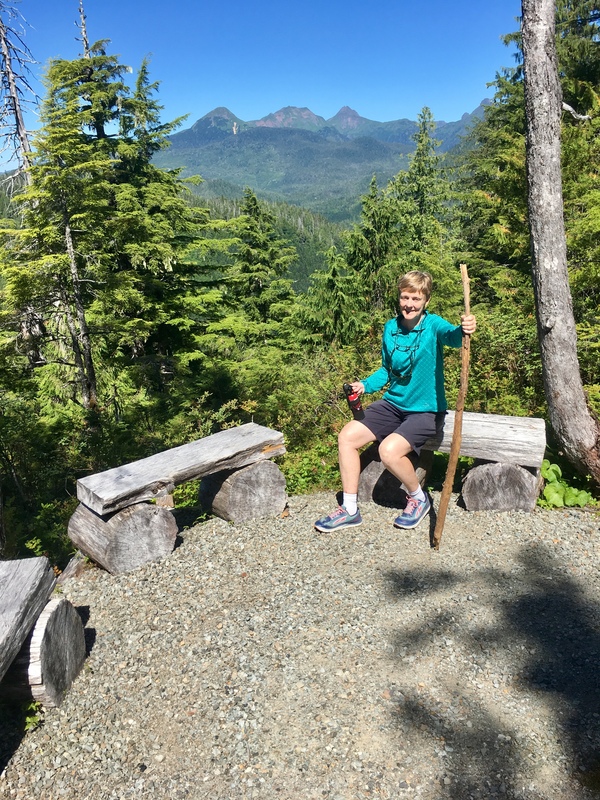 We then stop in the middle of the island to hike the One Duck Trail. This steep one mile climb gained over 1000 feet and rewarded us with dramatic views of the island. 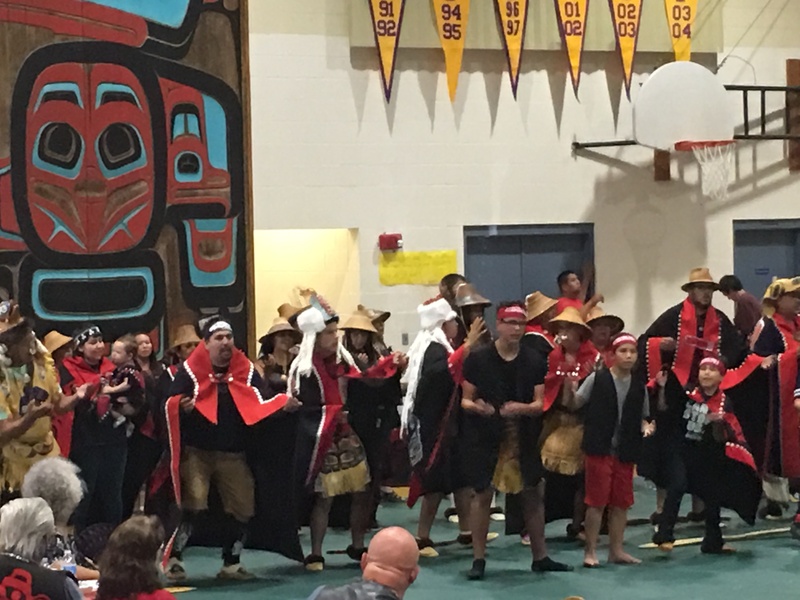 Our last stop of the day was to the Haida Indian village of Hydaburg. Today was the blessing of their newly constructed tribal long house. This is followed by a celebratory dinner and dance. 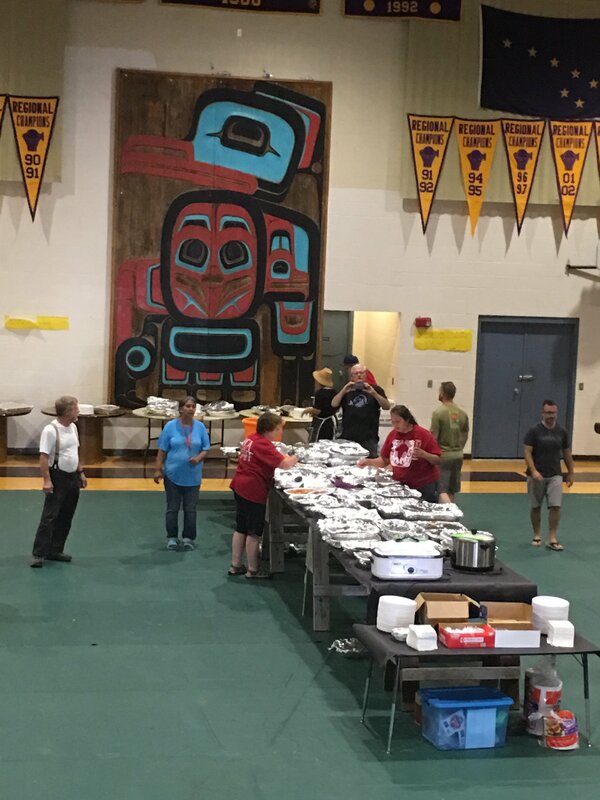 The First Nation people prepare a huge feast and invite the public to attend free of charge. The amount of food is incredible. We have halibut prepared eight different ways, salmon, several types of venison, along with native dishes made with seaweed and Kelp. The evening is capped with several native tribes preforming ceremonial dances. The next morning finds us heading north in the rental car to the El Capitan Cave. Ron and Michael from Spirit Journey along with their friends Heather and Bill join us for this trip. El Capitan Cave is the largest of the more than 500 caves on the Island with over two miles of mapped passages. We had a reservation with the Forrest Service for a two hour guided tour of the cave. 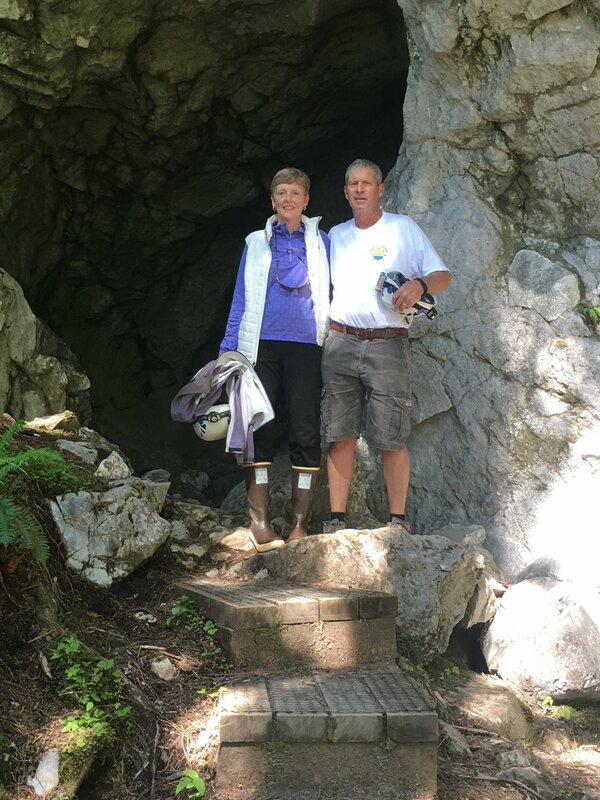 This limestone cave is typical of many others around the United States and the Forrest Service does a great job of limiting access to the cave interiors fragile environment. 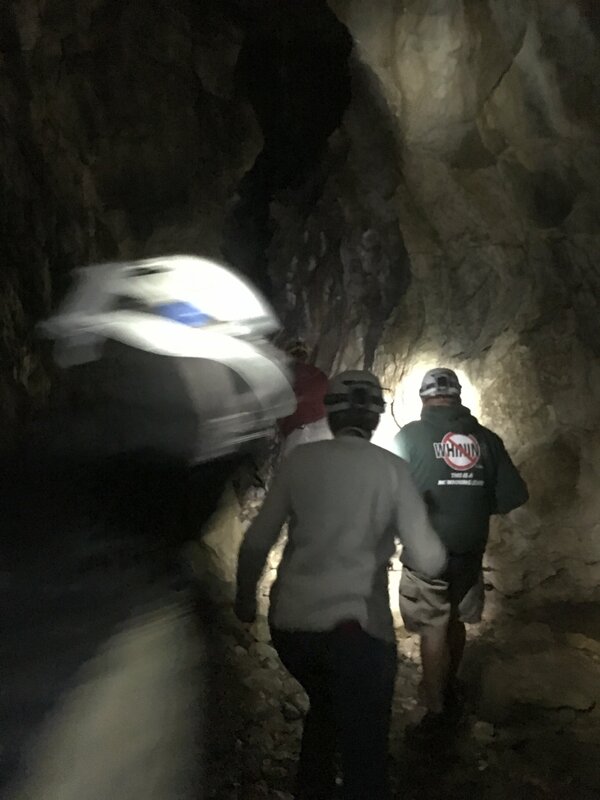 After being equipped with helmets and lights, we venture 600 feet into the cave crawling through several tunnels and visiting different rooms with names such as the fault room, flow stone room, and pool room. At one point the guide has us turn off all lights. The complete darkness is truly a unique experience. It is chilly in the cave with a constant temperature of 45 degrees. Retracing our steps, we are soon hit with warm air and bright sunshine. Our final three days at Thorn Bay are spent salmon fishing. Each morning we load up the dinghy with our fishing gear and head out to the mouth of Thorn Bay where we join a dozen other hopeful anglers running tight circles in the bay. We are novices at this and struggle to catch any fish while everyone else seems to be catching one after another. Ron on Spirit Journey takes pity on us and comes over with two lures for us to try. They are magic and we soon have a pink salmon in the bag. A few minutes later we have a second salmon on the hook, this time a Coho. From there things go downhill and we loose two really big fish as we are trying to net them so we call it a day. Our fishing technique gradually improves over the next two day. 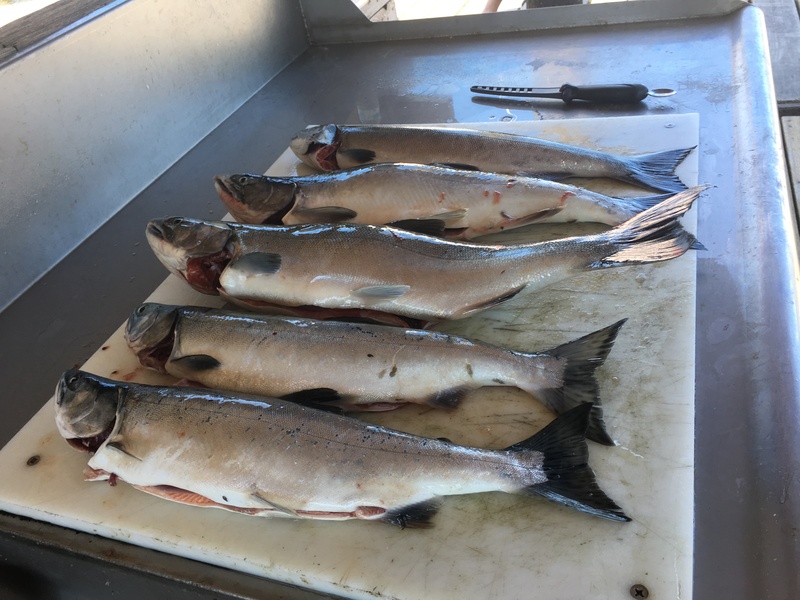 Each day we increase our catch culminating in a record for us of five salmon on the last day. We still manage to loose as many as we catch but had great fun in the process. 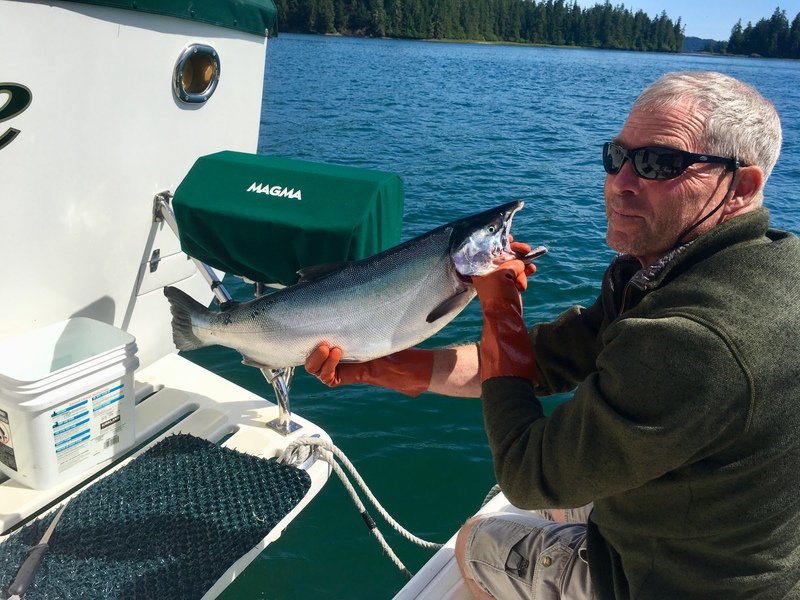 Our freezer is now full and we are able to give Tom and Jan aboard Sun Chaser two of the salmon as they do not fish. Leaving Thorne Bay we make a two hour stop in Ketchikan to ship our freezer full of fish home. Frontier Shipping, located just a block from the docks, make this easy. We packaged everything up in an insulated box and it went directly into their freezer. They will put it on a plan tomorrow headed to Juneau where it will be transferred to FedEx for an overnight shipment back to TN. Now we can continue fishing. Rekindle and Spirit Journey join us for five nights on Duchess Island at a beautiful well protected anchorage where we hunker down while gale force winds roar across Dixon Entrance. The seas are currently 17 feet at the Dixon Entrance Sea Buoy. Winds are forecast up to 45 knots outside. We haven’t seen more than 15 knots here in Pond Bay. We had high hopes of good fishing for this area. 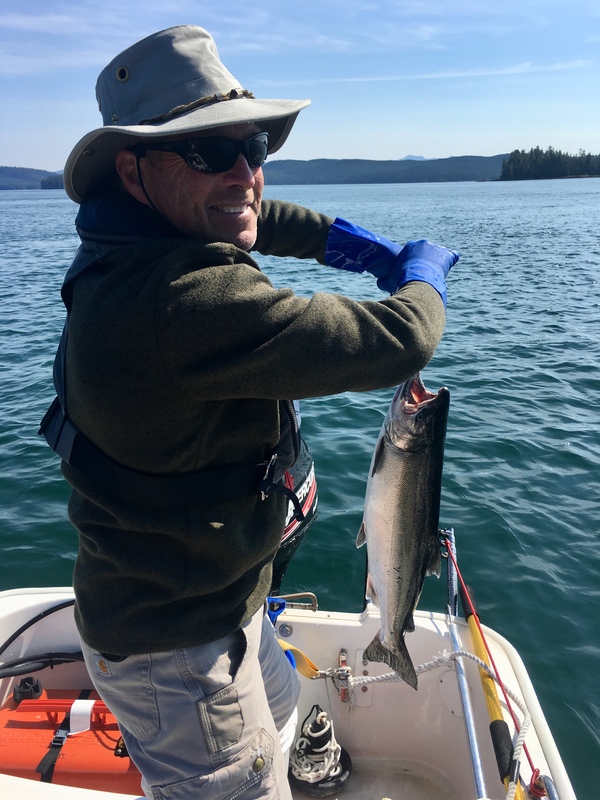 The only thing any of us have caught are some rockfish, baby halibut, and other strange creatures but nothing for the freezer. 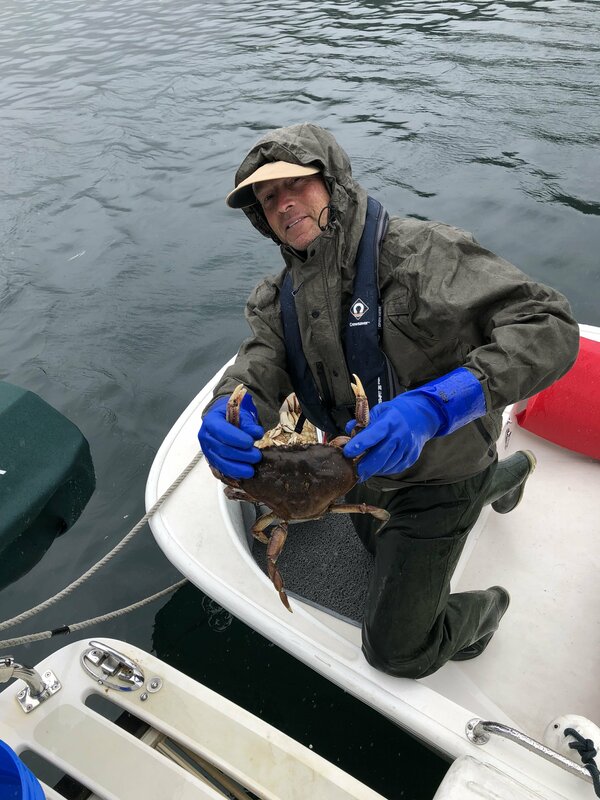 We are however catching lots of gigantic male Dungeness crabs. Tomorrow looks like a good day for our open water passage across Dixon Entrance to Prince Rupert. After five days at anchor, we are ready to get underway. Our next blog should be from British Columbia. This entry was posted on September 14, 2018 at 4:15 pm. You can follow any responses to this entry through the RSS 2.0 feed. You can leave a response, or trackback from your own site.